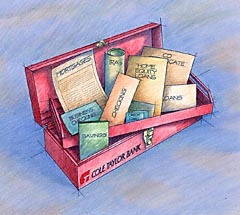 Cole Taylor Bank required an image of a toolbox to use in a conceptual ad campaign, designed to attract new commercial customers to the bank. Cole Taylor Bank contracted with Randal Birkey through his Chicago artist rep, to provide an illustration of an open toolbox on a blueprint paper background. This image was supplied to the bank’s ad agency who dropped in the ad headline and copy over it. The toolbox drawers and compartments represented various services and products offered by the bank to commercial customers.